Green Mapping can be likened to preparing for a long road trip. The more thorough your preparation, the better chance there is that you will reach your destination safely and on time. In putting the same dedication to detail is true. The more you know about the greens that you will putt on, the more accurate will be your reads, and the greater probability you will have of success. Slope, particularly at the Hole. Path your Ball must take. Speed your Ball must travel to Hole on your Chosen Path. Shape and Size of the Green. Direction of Grain, if any. Speed of the Green based on the Mowing Height. Moisture content of the Putting Surface. Growth Pattern of Grass according to the Season. Overall condition of the Green. For every putt there are always a number of variables that you have to consider. The more you can nail down beforehand basic information about the green and its contours, the less you will have to do when it is your turn to putt. If you play the same course regularly, it makes sense to get a better handle on how your ball will break on each of the 18 greens. Relying on your memory to recall if a putt breaks left to right, right to left, or is straight, is fraught with error. Professional golfers know that they will putt with greater confidence when they have done their homework before the tournament starts. They make written notes during their practice round of the different breaks at different parts of the green for every hole. Green Mapping, or green charting as it is sometimes called, involves more than having a sketch of the green. However this is the first step. On tour there is a yardage book available that shows what is considered to be public information – distance from various markers, depth of greens and so on. 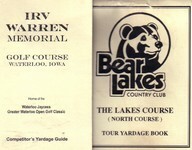 For the amateur golfer most courses sell a similar, less detailed, yardage book. When it comes to the greens the direction of breaks at possible pin locations is not provided. The pros together with their caddie will putt at pin locations previously used for the tournament, either to update their record or to gather the information for first time. Many of them will use a Putt Reading Device to show the local fall line at each location and the degree of the slope. For weekend amateurs whose income is not dependent on their putting skill, knowing which way the ball will break in different parts of the green is less essential. That is unless they want to have fewer misreads and hole more putts. There are a number of GPS systems available to golfers that show distances from Point A to Point B anywhere on the course with an accuracy within three yards. They show the hazards and the shape of the greens with depth measurements. On some of the smaller Tours they are now allowed under a local rule in an effort to speed up the pace of play. However, despite their sophistication the GPS systems don't give you detailed information about how your putts will break. This information you must still gather yourself. This is why Green Mapping is useful to putting better. You should prepare a Green Map for each green and then carry it with you to help you improve your reads and hole more putts.